Ray Cruz is a graphic artist, consultant and custom lettering designer. For over three decades his diversified skills have allowed him to work with advertising agencies, publishers, package design firms, branding firms and corporate clients. Designing new and custom typefaces is his favorite endeavor. 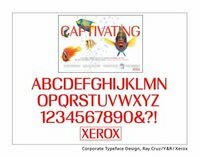 His fonts are available from several foundries including his own: Cruz Fonts. Ray has received over 30 graphic and type design awards from TDC, AIGA, ADC and other art associations. Currently, he is an adjunct professor at FIT and Kean University teaching type design and drawing with Adobe Illustrator. He is a member of the Type Directors Club and other art associations. “My passion for typographic design has allowed me to be involved with many aspects of the graphic arts industry. For almost three decades, I have offered my lettering and design expertise to publishers, packaging design firms, corporate identity firms, and advertising agencies. Many of these assignments have involved creating unique solutions for book jackets, logos, type systems and custom headlines for ads.